During the Eocene, Australia remained largely connected to Antarctica and supposing everything is more or less right, it is reasonable that the circumpolar current was cut of and equatorial waters were diverted onto these shores in just the same way the gulf Stream is diverted today. Shift all this a little bit and the landmass available to hold a polar ice cap disappears. Certainly it was all about geological configuration for this local phenomena to arise. Add in the chemical changes that led to global cooling reported on earlier this month and we have a rough outline of what took place then. It is clear that during the Eocene that the Ice Caps largely did not exist although the best likely were located in Antarctica even then. 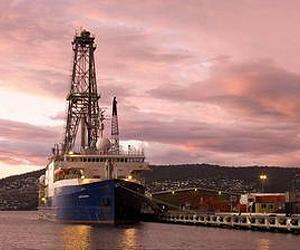 The scientists used the drillship JOIDES Resolution to recover sediment cores off the Antarctic coast. Drilling reached a depth of more than 1,000 m below the sea floor. Credit: Rob Dunbar, Stanford University. Given the predicted rise in global temperatures in the coming decades, climate scientists are particularly interested in warm periods that occurred in the geological past. Knowledge of past episodes of global warmth can be used to better understand the relationship between climate change, variations in atmospheric carbon dioxide and the reaction of Earth's biosphere. An international team led by scientists from the Goethe University and the Biodiversity and Climate Research Centre in Frankfurt, Germany, has discovered an intense warming phase around 52 million years ago in drill cores obtained from the seafloor near Antarctica - a region that is especially important in climate research. The study published in the journal Nature shows that tropical vegetation, including palms and relatives of today's tropical Baobab trees, was growing on the coast of Antarctica 52 million years ago. These results highlight the extreme contrast between modern and past climatic conditions on Antarctica and the extent of global warmth during periods of elevated atmospheric carbon dioxide levels. Around 52 million years ago, the concentration of the greenhouse gas carbon dioxide (CO2) in the atmosphere was more than twice as high as today. "If the current CO2 emissions continue unabated due to the burning of fossil fuels, CO2 concentrations in the atmosphere, as they existed in the distant past, are likely to be achieved within a few hundred years", explains Prof. Jorg Pross, a paleoclimatologist at the Goethe University and member of the Biodiversity and Climate Research Centre (BiK-F) in Frankfurt, Germany. "By studying naturally occurring climate warming periods in the geological past, our knowledge of the mechanisms and processes in the climate system increases. This contributes enormously to improving our understanding of current human-induced global warming." Computer models indicate that future climate warming will be particularly pronounced in high-latitude regions, i.e., near the poles. Until now, however, it has been unclear how Antarctic terrestrial ecosystems responded in the geological past to a greenhouse climate with high atmospheric CO2 concentrations. The scientists working with Prof. Pross analysed rock samples from drill cores on the seabed, which were obtained off the coast of Wilkes Land, Antarctica, as part of the Integrated Ocean Drilling Program (IODP). The rock samples are between 53 and 46 million years old and contain fossil pollen and spores that are known to originate from the Antarctic coastal region. In an area where the Antarctic ice sheet borders the Southern Ocean today, frost-sensitive and warmth-loving plants such as palms and the ancestors of today's baobab trees flourished 52 million years ago. The scientists' evaluations show that the winter temperatures on the Wilkes Land coast of Antarctica were warmer than 10 degrees Celsius at that time, despite three months of polar night. The continental interior, however, was noticeably cooler, with the climate supporting the growth of temperate rainforests characterized by southern beech and Araucaria trees of the type common in New Zealand today. These new findings from Antarctica also imply that the temperature difference between the low latitudes and high southern latitudes during the greenhouse phase 52 million years ago was significantly smaller than previously thought. "The CO2 content of the atmosphere as assumed for that time interval is not enough on its own to explain the almost tropical conditions in the Antarctic", says Pross. "Another important factor was the transfer of heat via warm ocean currents that reached Antarctica." When the warm ocean current collapsed and the Antarctic coast came under the influence of cooler ocean currents, the tropical rainforests including palms and Baobab relatives also disappeared.